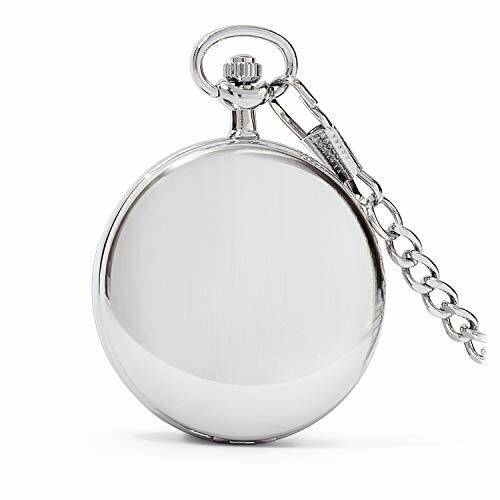 Classic brushed satin silver-tone pocket watch with an elegant minimalist dial design. Featuring a black dial, analog quartz movement, date window located at 3 o'clock, seconds sub-dial, highly polished hands and indexes, 14" diamond cut curb chain with easy to clasp spring ring and engravable front and back outer case. 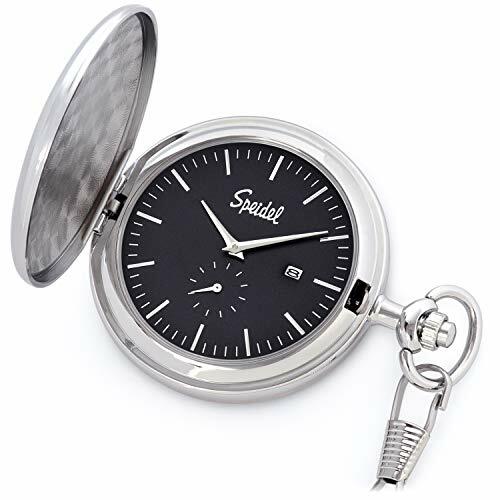 A Speidel pocket watch is a great holiday, birthday or any other special occasion gift idea packaged in a beautiful box that would make a great addition to anyone's timepiece collection. 100% SATISFACTION GAURANTEE: We are sure that you are going to love your new Speidel pocket watch, but if for some reason you are not satisfied within 30 days of purchase, we will send you your choice of a 100% refund or replacement. Additionally, you will also receive our 2 year manufacturer's warranty. Please feel free to contact us with any issues that you may have and we will make it right.